Uplift modeling predicts what will influence a consumer to take the action you want. This free webinar from the Predictive Analytics World conference series gives an introduction into this rapidly growing area of data modeling. Predictive analytics shows how a consumer will interact with content, but it has limited insight into why. 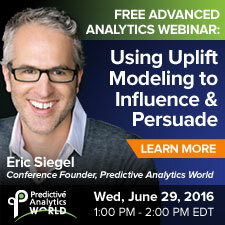 Uplift modeling predicts what will influence a consumer to take the action you want. This free webinar from the Predictive Analytics World conference series gives an introduction into this rapidly growing area of data modeling. Data driven decisions are meant to maximize impact - right? Well, the only way to optimize influence is to predict it. The analytical method to do this is called uplift modeling, also known as persuasion modeling. This is a completely different animal from standard predictive models, which predict customer behavior. Instead, uplift models predict the influence on an individual's behavior gained by choosing one treatment over another. In this webinar, Eric Siegel will provide an introduction to this growing area. Eric Siegel, Ph.D., founder of the Predictive Analytics World conference series and executive editor of The Predictive Analytics Times, makes the how and why of predictive analytics understandable and captivating. He is the author of the award-winning Predictive Analytics: The Power to Predict Who Will Click, Buy, Lie, or Die, a former Columbia University professor who used to sing to his students, and a renowned speaker, educator, and leader in the field. Eric has appeared on Al Jazeera America, Bloomberg TV and Radio, Business News Network (Canada), Fox News, Israel National Radio, NPR Marketplace, Radio National (Australia), and TheStreet. Please reserve your seat today. Space is limited. The webinar will take place on Wednesday, June 29 at 1:00pm EDT. We hope you can attend, but if you sign up and can't make it, we'll send you a link to view the deck and recording the day after the webinar.Â This webinar is accessible via Mac, PC, or mobile device.